Got my Escapes yesterday. They are great! Would definitely recommend them to anyone who is still on the fence. How firm are these chairs. I was looking at the palliser mellow becouse it seems more plush. I received 4 Fusion Lagoons from Roman almost a week ago. I was replacing a sectional couch that had limited support. 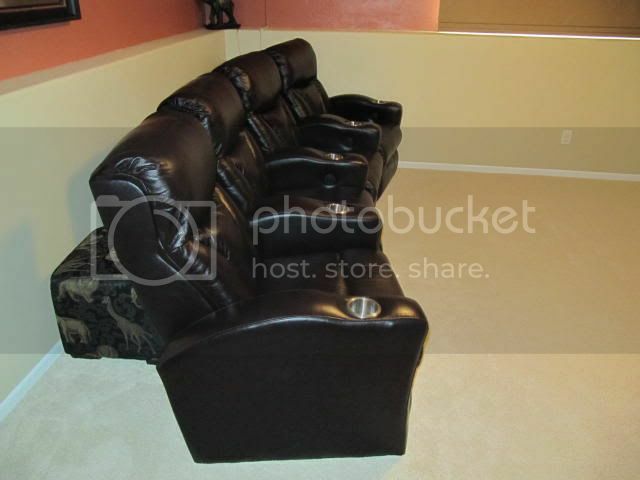 I was looking for leather theater seating with great comfort and good support. A couple of months ago I was visiting Minneapolis for work and was able to audition a few Pallisers (Rhumba, Slade/Blade, Mellow) and a couple Berklines (Reno, Trilogy). Going into the store I was hoping to find the Palliser Pacifico. I never did, but tried to make most note of the Slade, although not a fair comparison. It is "firmer" than all of the others, and I preferred the head support of the Slade all but the Rhumba. After this visit I narrowed down my choices to the Pacifico (Atomic w/ Trays) and the Fusion Lagoon. I posted my thread on this site earlier looking for other's feedback on the differences. I was able to get some feedback which helped me make my decision (although not sitting in either of these two). It came down to Price, other's feedback here on comfort/support, and of course appearance. These are on par with the the Rhumba's for comfort. The Lagoon is in first place for me as it relates to price, support, looks, and appearance. The only thing this chair lacks is the tray's that the Reno and Atomic have. In hindsight, I really don't care after setting this chair up in my family room... 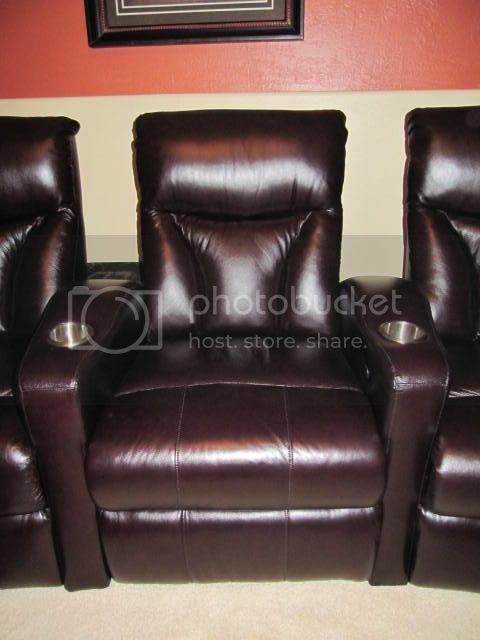 I chose brown leather/match, power recline, curved config. These are on par with the the Rhumba's for comfort. The Lagoon is in first place for me as it relates to price, support, looks, and appearance. 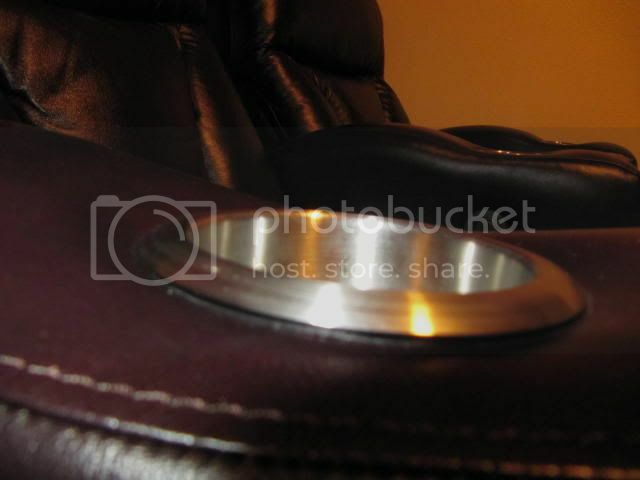 The only thing this chair lacks is the tray's that the Rhumba, Reno, and Atomic all have. In hindsight, I really don't care after setting this chair up in my family room... I chose brown leather/match, power recline, curved config. Awesome reply! I am heading to Roman's tomorrow to check out the seats and the espresso leather. Glad to hear you are happy! I looking from my phone but the leather looks pretty dark. I was hoping a little lighter but that would work too. Are they dark? They are dark, which I prefer. I hope they work for you as they are for me! You are correct, sorry for that miss on my part. The Rhumba does have the sliding armrest, a feature that I do not understand. I never seriously considered buying this chair, although I did find it very comfortable. Though I'm in the process of a basement makeover, I worked with Roman a couple of weeks ago to determine which chairs would be the best for my family (wife, 16 month daughter, 2 German Shorthaired Pointers). First, the experience of working with Roman was top notch. I'll guarantee that we spent over an hour on the phone discussing different options, configurations, materials, etc. At no point did I ever get "sold", but rather I was given the information by Roman and was allowed to decide for myself. In the end, I ordered 2 of the Fusion Escapes in brown leather. The buying process was super simple, and within 4 days I had my chairs delivered - the shipping company even helped me get them in the garage (no white glove delivery) and helped me unbox them to insure that there was no damage. Now, my impressions of the chairs: P E R F E C T! They are comfortable to a fault. The assembly was all of about 3 minutes. Seating is firm, but not overly so. The power headrest is unbelievable (thanks for alerting me to the option, Roman). The refrigerated cupholders are just a bonus - but a welcome one . An important point - my wife loves them! Though I'm no seating expert, if anyone is on the fence about either these chairs or working with Roman, let the fears rest. You can expect a professional experience from the first moment of contact all the way until you're relaxing in your new furniture. Once the basement is finished, I'll be sure to post a couple of pictures. I also went with the Fusion Escapes from Roman. I got 5 in black leather. 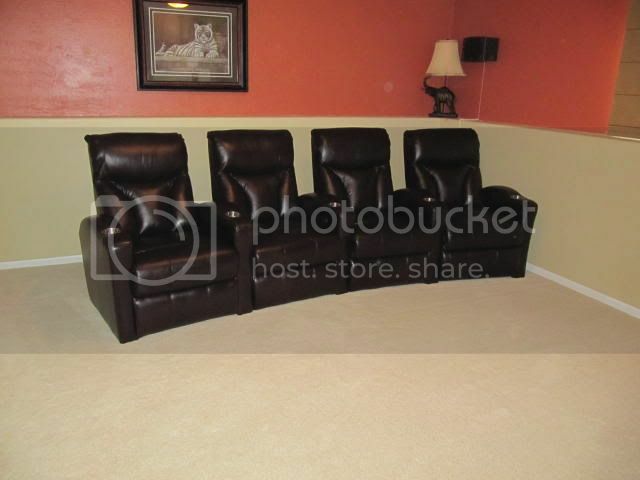 I replaced the front row of ~10 yr old reclining sectional LaZBoy seats that were still in perfect shape but lacked some of the key features--cup holders, tray tables, automated head rests, auto recline. Very quick delivery turnaround, although I had to plead with the delivery company somewhat to get them to bring them out the day before Thanksgiving, since many of their employees were trying to get out early! I put 3 in the theater and 2 in the video game TV area. These seats are phenomenal! They are so comfortable. My biggest problem with the LZBs was I'd have to put a pillow under my head to properly see the screen when reclined. With the adjustable headrest on these, problem solved! A couple things to note, the touch buttons can be a little finicky at first, somewhat of a learning process to how to touch them, but not an issue. Also, my feet don't touch the ground when I sit in them, not an issue, but also a reason for at least some amount of recline. These seats are amazing, not only for watching movies, but for videogaming with my son. They are perfect videogaming chairs. The tray tables also make great laptop stands. All in all, though I'm now overloaded with extra furniture, I'm very happy with my purchase. I went to see Roman’s Fusion chairs last week on Black Friday. This was a perfect opportunity as I got to combine the long trip with a visit to Bridgewater mall where the Mrs. and I did a great job of getting Christmas gifts for the family at discounted prices. Well onto the more important part of the trip. As I mentioned a few posts above, I went to Roman’s shop a few years ago to check out the Berkline imports. As I said I was pretty disappointed and wrote off the Berkline imports and started looking at the domestic Berklines which from some experience I found to be made far superior to the imports. Roman had a decent amount of Berkline Imports leftover as well as a few on display but I did not sit in any of them so the rest of the post will based on my memory. Regarding both the Lagoon and Escape, I found the seats to be more comfortable than the Berkline Imports with a solid firm support. I hate seats that you absolutely fall into, these had the right amount of firmness and any give over time would still be a big win. I didn’t get a good look at the frame construction, but I did feel as if the seats were well constructed and would hold up over time, something I thought the exact opposite for the Berkline Imports. There were 2 Lagoon seats on display and 1 Escape. I sat in both Lagoon seats and oddly enough found one to be softer than the other. I’m not sure if this is a QC issue, typical manufacturing variance, or if one of the seats had been there longer and sat in more times than the other. Another idea that I thought maybe the case is one of the seats was in the bonded leather and the other real leather. The bonded was the softer seat which I did not prefer but was still certainly comfortable and if that is what a “used” seat felt like, it worked for me. For anyone on the fence about bonded leather, I will provide my personal opinion. If you like leather that is dimpled, then it is a no brainer to go with the bonded leather. This bonded leather in my opinion is vastly different that the old Berkline bonded leather. The old Berkline bonded leather you could feel was not leather, ironically I loved it and if I did the imports I would have gone with it because I really liked the softness. The Fusion bonded leather really feels like real leather as well as looks like real dimpled leather. I personally do not like dimpled leather, but plenty do. In regards to the real leather option, I thought it was very nice and appeared to be durable. It was a tight fit that I could see stretching a little over time but still maintain a good look. The espresso brown is a wonderful color; it gives off the appearance of a dark mahogany stain. With the lights off, I think it would appear black. The leather had a nice sheen to it where the bonded leather had no sheen. On to my opinion of each chair. I am 6’ 3” and 220lbs I sat in the Lagoon which is the chair I was interested in. I thought the comfort was nice and the width was perfect. The arms were comfortable as well but could use additional padding. The headrest was a hair low but I am also pretty tall so that is expected. My biggest gripe in the seat is that when fully reclined your head is also laying flat which makes it difficult to see the screen. This can be fixed with a small pillow and you’re set. As pictured above by another forum member, the display model had the cup holding sticking out, but since there appears to be a simple fix, it is of no concern. The reclining mechanism was good also, no sound and smooth operation. The controls are also very simple with an easy forward and reverse button that can’t be messed up. The chairs also have a nice appearance, a bit on the small side but I fit in it so no problem there. Next I sat in the Escape….WOW is all I can say. Comfort was outstanding. While the Lagoon was comfortable, this was on another level. I guess the placement of the cushions played a big role in that. Same as the Lagoon the recline mechanism was perfect. The spot where the Escape REALLY shines is that ridiculously awesome power headrest, this is up with sliced bread. The powered headrest solved the problem I mentioned earlier with the Lagoon and using a pillow except with numerous possible positions to perfectly support your head. My wife was me, she is 5’ 3” tiny little thing and she was in love with the chair’s comfort and powered headrest. I could tell which chair she liked better. I didn’t try out the cooling cup holder so I can’t comment on that. The buttons on the Escape were a bit small and since there are so many features on this chair it has quite a few buttons. I think I would drop the cooling feature just to eliminate a button and make it easier to use. The power recline buttons are pretty tiny as well as the power headrest button, I can see these being easily confused. I particularly don’t like storage space in the arm rests, but if it is your thing the Escape has ample space for magazines and remotes. I don’t particularly like tray options either, but again if this is your thing the Escape has it. The tray that is supplied is pretty flimsy as mentioned above. I would definitely make something custom to use and throw away the supplied one. As for the design, it is nicer than it appears online, but not quite my cup of tea which may be because I have the notion a chair should like the Lagoon or the very similar Berkline 45034. The Escape is also priced quite a bit more than the Lagoon but rightfully so with the powered headrest…it really is that great! I apologize for the really long post, but I figure I am one of the few who gets an opportunity to try out both seats, so I might as well take note of as much as possible and report back to the people who have helped me so much over the years…In other news, I should finally begin to utilize the knowledge I gained here and begin building my theater in the next few weeks! I went to see Roman's Fusion chairs last week on Black Friday. This was a perfect opportunity as I got to combine the long trip with a visit to Bridgewater mall where the Mrs. and I did a great job of getting Christmas gifts for the family at discounted prices. Well onto the more important part of the trip. As I mentioned a few posts above, I went to Roman's shop a few years ago to check out the Berkline imports. As I said I was pretty disappointed and wrote off the Berkline imports and started looking at the domestic Berklines which from some experience I found to be made far superior to the imports. Roman had a decent amount of Berkline Imports leftover as well as a few on display but I did not sit in any of them so the rest of the post will based on my memory. Regarding both the Lagoon and Escape, I found the seats to be more comfortable than the Berkline Imports with a solid firm support. I hate seats that you absolutely fall into, these had the right amount of firmness and any give over time would still be a big win. I didn't get a good look at the frame construction, but I did feel as if the seats were well constructed and would hold up over time, something I thought the exact opposite for the Berkline Imports. There were 2 Lagoon seats on display and 1 Escape. I sat in both Lagoon seats and oddly enough found one to be softer than the other. I'm not sure if this is a QC issue, typical manufacturing variance, or if one of the seats had been there longer and sat in more times than the other. Another idea that I thought maybe the case is one of the seats was in the bonded leather and the other real leather. The bonded was the softer seat which I did not prefer but was still certainly comfortable and if that is what a used seat felt like, it worked for me. I am 6' 3 and 220lbs I sat in the Lagoon which is the chair I was interested in. I thought the comfort was nice and the width was perfect. The arms were comfortable as well but could use additional padding. The headrest was a hair low but I am also pretty tall so that is expected. My biggest gripe in the seat is that when fully reclined your head is also laying flat which makes it difficult to see the screen. This can be fixed with a small pillow and you're set. 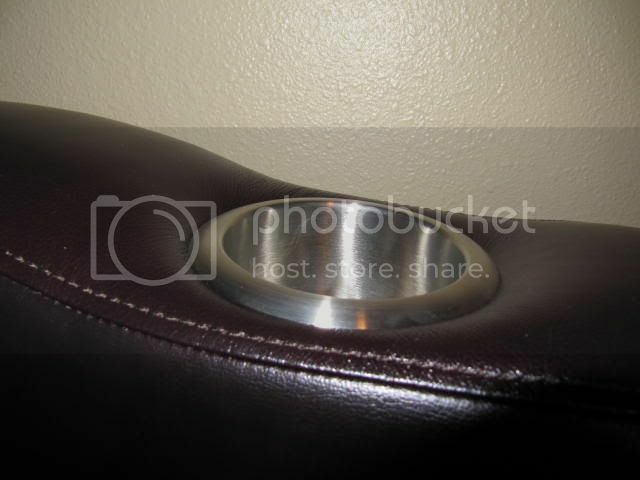 As pictured above by another forum member, the display model had the cup holding sticking out, but since there appears to be a simple fix, it is of no concern. The reclining mechanism was good also, no sound and smooth operation. The controls are also very simple with an easy forward and reverse button that can't be messed up. The chairs also have a nice appearance, a bit on the small side but I fit in it so no problem there. Next I sat in the Escape.WOW is all I can say. Comfort was outstanding. While the Lagoon was comfortable, this was on another level. I guess the placement of the cushions played a big role in that. Same as the Lagoon the recline mechanism was perfect. The spot where the Escape REALLY shines is that ridiculously awesome power headrest, this is up with sliced bread. The powered headrest solved the problem I mentioned earlier with the Lagoon and using a pillow except with numerous possible positions to perfectly support your head. My wife was me, she is 5' 3 tiny little thing and she was in love with the chair's comfort and powered headrest. I could tell which chair she liked better. I didn't try out the cooling cup holder so I can't comment on that. The buttons on the Escape were a bit small and since there are so many features on this chair it has quite a few buttons. I think I would drop the cooling feature just to eliminate a button and make it easier to use. The power recline buttons are pretty tiny as well as the power headrest button, I can see these being easily confused. I particularly don't like storage space in the arm rests, but if it is your thing the Escape has ample space for magazines and remotes. I don't particularly like tray options either, but again if this is your thing the Escape has it. The tray that is supplied is pretty flimsy as mentioned above. I would definitely make something custom to use and throw away the supplied one. As for the design, it is nicer than it appears online, but not quite my cup of tea which may be because I have the notion a chair should like the Lagoon or the very similar Berkline 45034. The Escape is also priced quite a bit more than the Lagoon but rightfully so with the powered headrestit really is that great! I apologize for the really long post, but I figure I am one of the few who gets an opportunity to try out both seats, so I might as well take note of as much as possible and report back to the people who have helped me so much over the yearsIn other news, I should finally begin to utilize the knowledge I gained here and begin building my theater in the next few weeks! Thanks for the review Larry. At 6'3", how far over the edge did your feet dangle when fully reclined? I like the Escape, but am concerned that the support for my legs will end somewhere mid-calf and be uncomfortable for a 2 hour sit. The Escape-1019 actually sits higher and has a longer seat/footrest area. I'm sitting in one of my Lagoons righ now with legs fully extended and chair back still up. If that is true, GREAT! For those who tested out the chairs, which model would you say has the best lumbar support? You could probably just call and ask. I called for the first time last week and he spent almost 40 minute on the phone with me giving me information. And most of it was him explaining to me the differences between brands without me even asking questions. I only live about an hour from him so I may try and drive down there and check them out. Im still about two months away from needing the chairs. Aren't you Jersey based? Roman's warehouse is in Jersey, I think out on 287 if memory serves. Go check em out yourself (and report back). 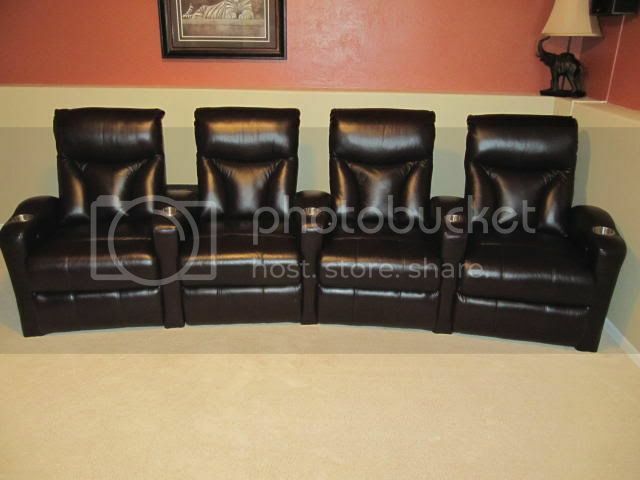 I just ordered 6 seats (2 rows 3 straight configuration) Black leather/vinyl match Fusion Lagoon from Roman. I'll post pics and my review/impressions and ordering experience when they come in. loving the seats.. had one small issue roman helped me out and all of them work great! Nice Theater. I was debating on the Escape but ultimately decided on the lagoon. How is the comfort of the escape? Mine are coming in tomorrow. they feel incredible good lumbar, very comfortable, i haven't watched any movies yet, because that part of the theater is not working completely yet but i have watched some tv in there and it's great, i think 2 hours can pass without even noticing, i see many saturdays spent in there. i think the power headrest is cool, but so far i haven't really needed it. but i do like having it.